Looking for some family fun? Camping is a great get away for this time of year as the weather changes! It’s not too cool and not sweltering hot anymore! If you’re in or around Arlington, TX you can enjoy the annual Family Fun Camp Out for just $10 per person (kids 2 and under are free). It’s coming up quick, so make your plans now to attend October 10 – 11, 2014 4 pm – 7 a.m. Spend quality time with your family enjoying a night of camping out in the park. 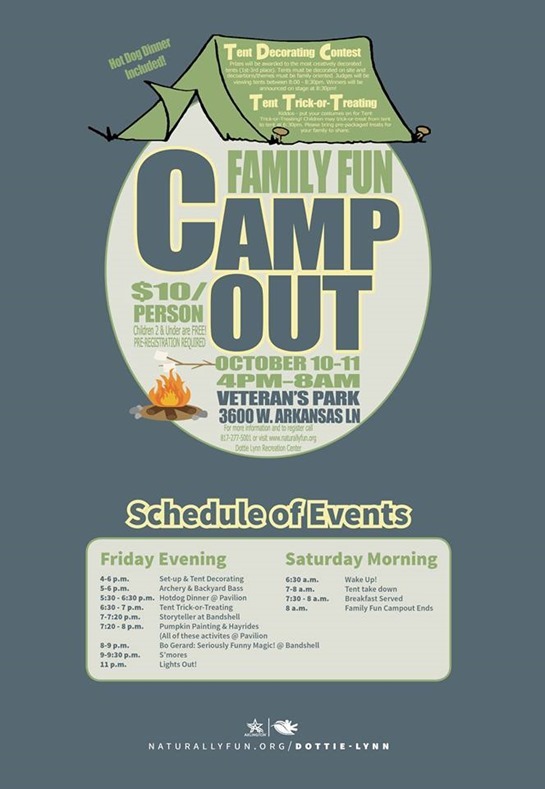 Join the Arlington Parks and Recreation Department on Oct. 10-11, from 4 p.m. – 7 a.m. for the annual Family Fun Campout at Veterans Park! Games and family entertainment will be provided. Activities will include tent decorating, s’mores and lots of family fun. This is a great way to celebrate the fall and start a family tradition and memory that will last a lifetime. For more information contact the Dottie Lynn Recreation Center at 817-277-5001!